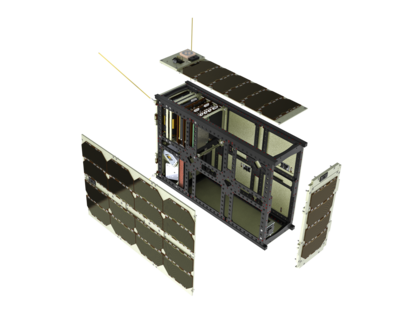 The advanced 6U platform configuration is based on the flight proven GomSpace platform used in the successfull GOMX-4 mission launched in February 2018. It is the baseline platform for many commercial missions delivered by GomSpace. If further pointing or position knowledge and control is needed this can be added as platform elements to the ADCS system. Also GomSpace can provide a Cold Gas Propulsion system to support orbital manuevers during mission lifetime or for faster de-orbiting after end of main mission lifetime. To increase the available payload and platform power larger deployable solar panels can be chosen. To reduce development costs use the GomSpace predesigned 6U Standard Platform for your mission and take advantage of our knowledge and flight heritage to support your mission. For a standard platform delivery without payload integration, lead time is 6 months from receipt of order. The platform and its elements have been qualified according to the GomSpace qualification program, which includes tests in: Vibration, thermal cycling, heated vacuum, radiation and thermal stress. The platform is tested and ready for payload integration. Payload integration is offered by GomSpace as a paid service. Please contact us if you want to know how the 6U Standard Platform will perform in a specific orbit and/or with your payload, or if you want to learn more about options for upgrade with deployable solar panels, extra batteries, more precise ADCS or propulsion.